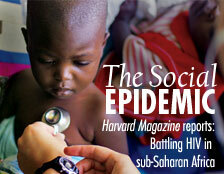 As one of four institutions chosen in 2004 to administer the President’s Emergency Plan for AIDS Relief (PEPFAR), Harvard oversees patient care at 10 hospitals and a network of clinics, and operates a drug distribution network, in Nigeria. Faculty members work with the Dar es Salaam City Council and a local university to provide care through clinics in Tanzania. And in Botswana, Harvard scholars advise the ministry of health on quality of care and data management and train health professionals. Shortly after Bloom became dean, he asked professor of immunology and infectious diseases Phyllis Kanki—who later became faculty director of Harvard’s PEPFAR program—to cowrite a grant with him for healthcare worker training and HIV prevention efforts in Nigeria. It was a departure for Kanki, whose previous work was in Senegal. But a 2000 report on HIV from the World Health Organization made a deep impression on Bloom. It said that Africa’s smaller and better-developed countries—Bot­swana, for example—provided good settings for creating model programs. But to ignore the epidemic in the continent’s largest countries, such as Nigeria, Ethiopia, and South Africa—to decline to try because the obstacles were too daunting—would mean losing the battle against AIDS in Africa entirely. When PEPFAR was announced in late 2003, Kanki applied; the grant required that each application cover three countries where the applicant had already worked, so Lasker professor of health sciences Myron “Max” Essex and professor of nutrition and epidemiology Wafaie Fawzi—HSPH faculty members with projects in Botswana and Tanzania, respectively—joined the application, which Bloom critiqued before its submission. University administrators were blindsided when they learned that Harvard had been awarded the funds, says Mark Barnes, the former executive director of the University’s PEPFAR program, who now holds faculty appointments at the schools of law and public health and directs the Office of Sponsored Programs. Harvard draws a clear line between the activities of teaching (for which it appoints and pays professors of medicine) and clinical care (for which those professors are paid by hospitals affiliated with, but not owned by, Harvard). Administrators considered declining the grant award. Unlike the other three recipients in the initial round—Columbia, Catholic Relief Services, and the Elizabeth Glaser Pediatric AIDS Foundation—Harvard was not used to delivering direct clinical care, and had pledged to do so in countries without smoothly functioning healthcare infrastructure. 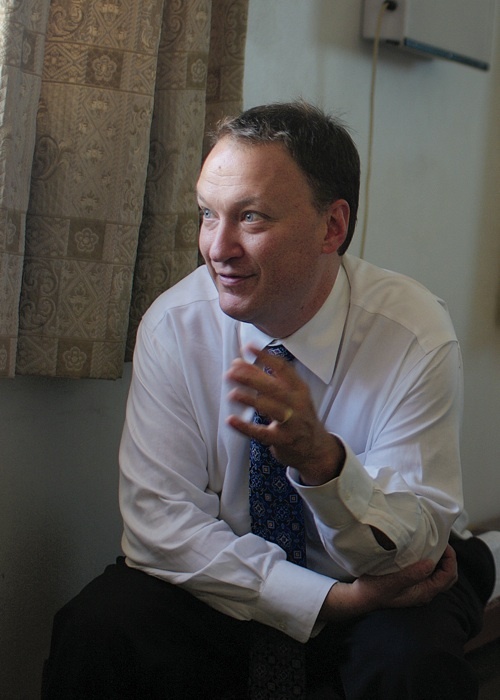 But it ultimately decided to accept the funds on the grounds that treating HIV in sub-Saharan Africa “was an emergency, and Harvard would respond to the emergency,” says Barnes. The central administration specified several conditions. This would be an exception for Harvard, not a new function it intended to expand. The faculty investigators on the grant would need to pull in people with expertise in healthcare delivery. Over time, even with PEPFAR, Harvard would shift its focus from providing care to its more typical roles of advising and research. And the grant money would be routed through not-for-profit entities based in each PEPFAR country, founded for this purpose. The bottom line, says Bloom, is this: “hundreds of thousands of people, without this program, would not have had access to care.” Harvard’s PEPFAR program has paid for antiretroviral therapy (ART) for more than 130,000 people, and regular medical care for many more. It has funded training for more than 16,000 healthcare workers in the three countries. Not counting separate PEPFAR grants overseen by HMS faculty members whose primary appointments are through the hospitals, this is still by far the largest government grant Harvard has ever received: $65 million this year. But as Harvard has become comfortable in its role, the program’s overall status may be waning. In late 2008, Congress authorized spending $48 billion through 2013, a major expansion over the $15 billion allocated for the first five years, but President Obama has since spoken of plans to level-fund PEPFAR and focus instead on maternal and child health.